(SKNIS): The Ministry of Community Development, Gender Affairs and Social Services joined the international community on March 8, 2017, in the celebration of International Women’s Day under the theme “Be Bold for Change” with an annual awards ceremony held under the distinguished patronage of His Excellency the Governor General Sir Tapley Seaton at Government House. 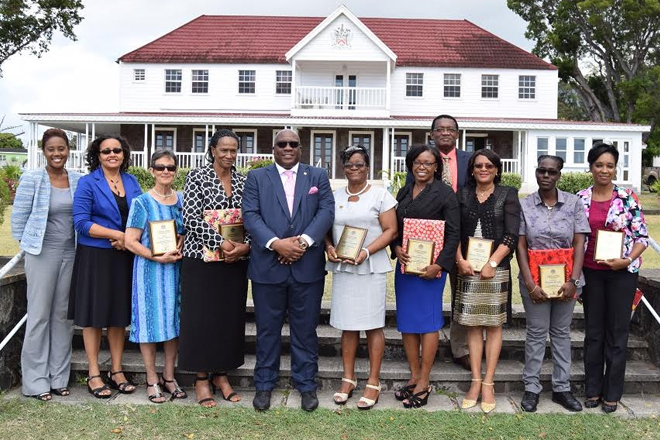 Eight pioneering women were celebrated for their stellar contributions to nation building in the fields of Tourism (Transportation), Nurturing, Public Service, Construction, Athletics, Entrepreneurship, Counselling, Volunteerism and Gerontology. The awardees were Shirley Julius (Pubic Service), Tiandra Browne (Construction), Michele de la Coudray-Blake (Counselling), Yvette Slack (Nurturing), Antoinette Henry (Athletics), Lucrecia Sargeant (Entrepreneurship), Dr Patricia Richards-Leader (Gerontology) and Beula Mills (Tourism/Transportation). Director of Gender Affairs, Celia Christopher, giving an address during the awards ceremony noted that this year’s theme for the commemoration of International Women’s Day is quite significant.